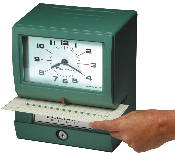 A heavy-duty time clock such as the Acroprint Model 150 can handle thousands of print registrations per day. These dependable workhorses are suitable for any size business in any environment. 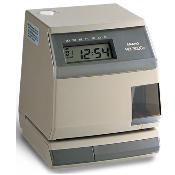 Multi-function side printing time clock or time stamp. 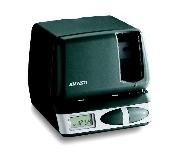 Battery backup, automatic time synchronization, adjustable print font size, internal LED light and more. 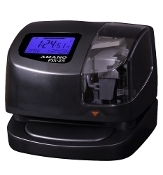 An all-in-one electronic time recorder and date stamp designed to meet the typical needs and special requirements of contemporary business. 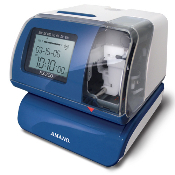 The PIX-200 includes a wide variety of features. 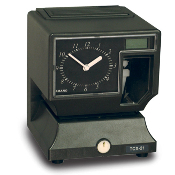 Automatically synchronizes to the NIST Atomic Clock via wireless radio signals and adjusts for Daylight Savings Time while providing the benefits of an economical payroll recorder and time and date stamp functionality. 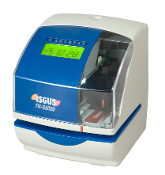 Both an electronic cost and payroll unit as well as a time and date stamping machine, the PIX-3000X is a heavy-duty, economical, and fully automatic side printer that imprints hours, minutes, and seconds. Also features alphanumeric character printing.